Senior Alexandra Zarchy is a feminist who actively seeks ways to empower women and speaks her mind when controversy arises. When Zarchy saw that Brett Kavanaugh was inducted into the Supreme Court, she was eager to take action on a small scale through a movement she created called High Schoolers 4 Her. She felt compelled by the sexual assault victims who spoke out and decided to make her voice heard. “I had eleven girls over and we called our Senators. Then [Kavanaugh] got confirmed. That’s how High Schoolers 4 Her took off, and we started Time’s Up Tuesdays. Now every Tuesday, we wear black and people have the Time’s Up pins to wear in solidarity,” said Zarchy. “Whether or not you believe Dr. Ford was sexually assaulted in high school, there is no question that it raised the issue of sexual assault.” Zarchy said. With all the chaos, Zarchy put the situation into her own perspective. She reflected on how she would feel if she were in Dr. Ford’s situation, and what message that would send to girls and boys of all ages. “I thought a lot about how I am in high school. I am currently in the age group which Dr. Ford was sexually assaulted by Brett Kavanaugh. If someone were to assault me or one of my friends, and I saw them sit in the highest court in our nation, that is not ok,” Zarchy said. “It tells girls that what they say, what they believed happened, and their body, doesn’t matter. Their one requirement is good behavior, and that constitutes good behavior. What type of example are we setting for boys and how they treat girls, and for girls that speak out?” said Zarchy. This year, Zarchy, along with some of her close friends, planned events to advocate for equality, raise awareness of sexual misconduct, reproductive rights, and body confidence. “We are going to talk about women’s reproductive rights. I specifically say not pro-choice or pro-life because those are both very polarizing terms. I want people there who really believe in the freedom to choose an abortion and people who really feel against abortions, along with people who have no idea what they are talking about,” Zarchy said. “I want to facilitate a group of voters that are armed with education because it’s only if we’re armed with education that we are going to make compromise, because we are the next generation,” said Zarchy. Many girls were quick to join Zarchy and her movement. Senior Ainsley Basic joined the movement because she places great value on women’s rights. 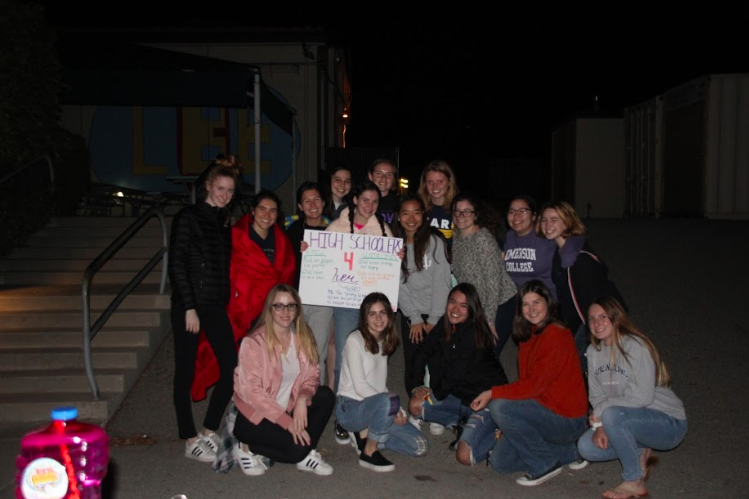 As co-president of PVOW (Palos Verdes Organization for Women), she felt High Schoolers 4 Her had a similar mission statement as PVOW, since both groups aspire to educate their community about equality. “I thought [High Schoolers 4 Her] really related to what I am passionate about in PVOW. I got involved because it stands for everything I stand for, and why not support other women?” said Basic. Today, women have a voice to share their stories in an effort to spread awareness about sexual assault and misconduct. For this very reason, Basic believes it is critical for High Schoolers 4 Her and PVOW to be recognized in an effort to make a positive influence on student’s future votes.